Good nutrition is essentional for good health. There are four basic nutrients the body needs: water, carbs, fats and protein. Half the US population suffers from a deficiency of one imortant nutrient. Nutrients act together so to correct a deficieny you need to add it to the others, ie eat a varied diet. 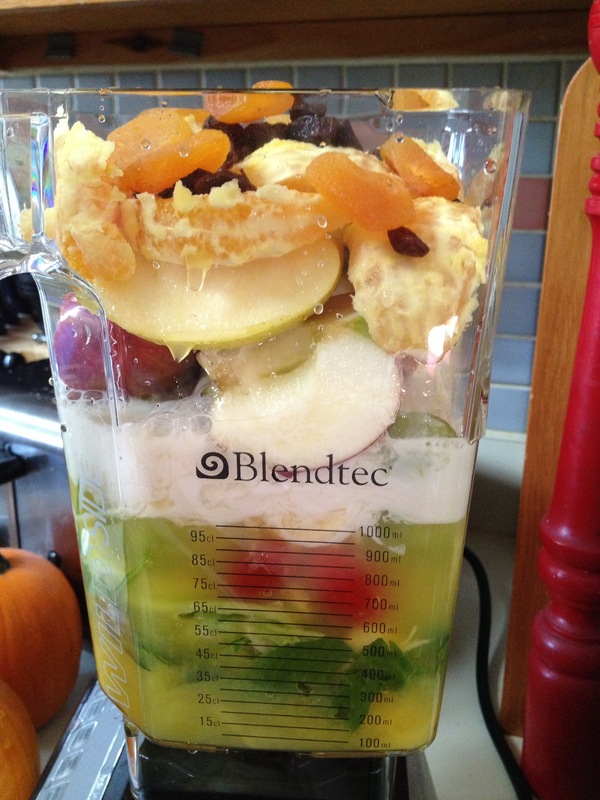 To help my son get plenty of nutrients we make him a smoothie every day. Smoothies have carbs, fats and protein! Today my husband took what he could find and blended it all together. A handful of spinach, grapes, OJ, apples, oranges, a banana, chia seeds, dried apricots and cabbage, raisin, almond milk and presto! The dried fruits sweetened it and the apple and oranges made it taste great. A proper diet is necessary for health. And our kids need all the help they can get! Omega-3 and omega-6 are essential fatty acids. Lab research suggests that the fats affect certain brain chemicals involved in nerve-cell communication and inflammation. The body cannot make them on its own, we obtain them from our food. In modern diets, there are few sources of omega-3 fatty acids, mainly cold water fish such as salmon, sardines, herring, mackerel, canola oil, walnuts, flaxseeds, leafy vegetables and chia seeds.Omega 3s are necessary for the membranes of neurons in our brain. By contrast, sources of omega-6 fatty acids are numerous in modern diets. They are found in seeds, nuts, and refined vegetable oils, such as soy oil, that is used in most of the snack foods, cookies, crackers, and sweets in the American diet as well as in fast food. Soybean oil alone is now so common in fast foods and processed foods that an astounding 20 percent of the calories in the American diet are estimated to come from this single source. I won’t go into the possibility that the soy could be GMO. The body also constructs hormones from fatty acids. In general, hormones derived from the two classes of essential fatty acids have opposite effects. Those from omega 6s tend to increase inflammation (an important component of the immune response), blood clotting, and cell proliferation, while those from omega 3s decrease those functions. Both families of hormones must be in balance to maintain optimum health. This dietary imbalance may explain the rise of such diseases as asthma, coronary heart disease, many forms of cancer, autoimmunity and neurodegenerative diseases, all of which are believed to stem from inflammation in the body. The imbalance between omega-3 and omega-6 fatty acids may also contribute to obesity, depression, dyslexia, hyperactivity and even a tendency toward violence. Bringing the fats into proper proportion may actually relieve those conditions, according to Joseph Hibbeln, M.D., a psychiatrist at the National Institutes of Health, and perhaps the world’s leading authority on the relationship between fat consumption and mental health. If you follow a anti-inflammatory diet, you should can get a healthy ratio of these fatty acids (1:1). In general, however, you can cut down on omega-6 levels by reducing consumption of processed and fast foods and polyunsaturated vegetable oils (corn, sunflower, safflower, soy, and cottonseed, for example). At home, use extra virgin olive oil for cooking and in salad dressings. Eat more oily fish, walnuts, flax seeds, and Chia seeds ( I sprinkle them on everything) for more omega 3s. “It’s not the vaccines that are the problem-it’s the additives” professor Ricard Deth, Northeastern University. Common additives to vaccines include mercury, aluminum, formaldehyde, MSG, sulfites, and antifreeze. Each of these have been associated with brain and nerve damage. Is Tourette a genetic problem or did our children get this disorder because of required vaccinations? The World Health Organization (WHO) called for the phasing-out of amalgam in their 2011 report. In May 2011, the Council of Europe also issued a proclamation calling for restrictions and prohibitions of mercury fillings, which are already banned in Norway, Sweden, and Denmark. Health Canada also stopped endorsing amalgam for use in children, pregnant women, and people with impaired kidney function, all the way back in 1996! The FDA has done nothing! And our dentists continue to use this toxic substance. “The report makes clear that alternatives are here today worldwide for children, who are the ones most vulnerable to amalgam’s neurotoxic effects,” said Charlie Brown, president of the World Alliance for Mercury-Free Dentistry. Alternative products exist. I have used resin composites but there are also glass ionomers. I used resin because I was told that toxic “overload” was not good for my son with Tourettes. If you want more information Consumers For Dental Choice has written extensively on this subject. When my son’s tics get bad we start doing some math problems. We have found that when his brain is “busy” thinking his tics go away. It has been great for long car rides or for falling asleep. 2+2, 10×6, 25/5, etc after four of these the tics stop. We also got out the board games, the monopoly, and checkers for afternoons on end. Finding words that rhyme also helped. Making up poems as well. So when the brain is busy, the tics leave, at least for my son. Unfortunately these are two people activities….. At least at the age of 9, maybe later he could do these on his own. I don’t know how neurotransmitters work, but it seems like they can’t multitask. It is very important to follow a nutrition plan that includes healthy, wholesome foods that can address all your nutritional needs. I recommend concentrating on stress reducing, nerve helping foods for those with Tourette. Remember the expression ” you are what you eat” ? Well the nutrients you choose to eat are very important. Vitamins are essential to life and are considered micronutrients (the term micro is for small amounts.) There are three Macronutrients, essential for the body to function, proteins, fats, and carbs. I found out our son was very sensitive to what he ate. His tics would get worse after going out to eat Chinese. He got Tourettes after a year of school cafeteria food. When we stopped vinegar, peanuts, and malt for three days we saw a marked improvement. The fist week of November was horrid, perhaps due to the Halloween candy! I would say that this helped tremendously and helped get rid of the tics his medication did not alleviate. After a year, we started reducing his meds in fact. TIC Talk is a group created initially for parents of kids with Tourettes. However, adults with TS are welcome to join us. The group is listed as closed to respectfully keep private things shared amongst the group. There are over 400 members so it is a good forum.